Colorado’s three National Heritage Areas show off the natural beauty and Western history our state is known for and represent Colorado’s many contributions to the nation’s diverse heritage. Congress has established nearly 50 National Heritage Areas since 1984, and Colorado is proud to be one of only 16 states to have more than one. Read on to learn about our National Heritage Areas and how you can experience them. Colorado’s mining and ranching heritage lives on in Park County’s South Park, an area known for its wealth of lovingly preserved historic structures and exquisite landscapes. Incorporating the central Colorado communities of Alma, Como, Fairplay, Hartsel, Jefferson and Lake George, the South Park National Heritage Area embodies the spirit of the American West. South Park’s diverse terrain is also a major part of the area’s significance. Situated in a vast river valley surrounded by 14,000-foot peaks, the area possesses an abundance of natural resources, including mineral deposits, ancient Bristlecone pines, unique geological formations and more than 100 rare or endangered plant and animal species. Slumber at Roberts Cabin in Como, a primitive log structure dating back to Como’s 1880s railroad era. Tucked at the base of Boreas Pass, the cabin affords unparalleled views of the Front Range and was restored in the 1990s for use as a cabin rental (reservations required). 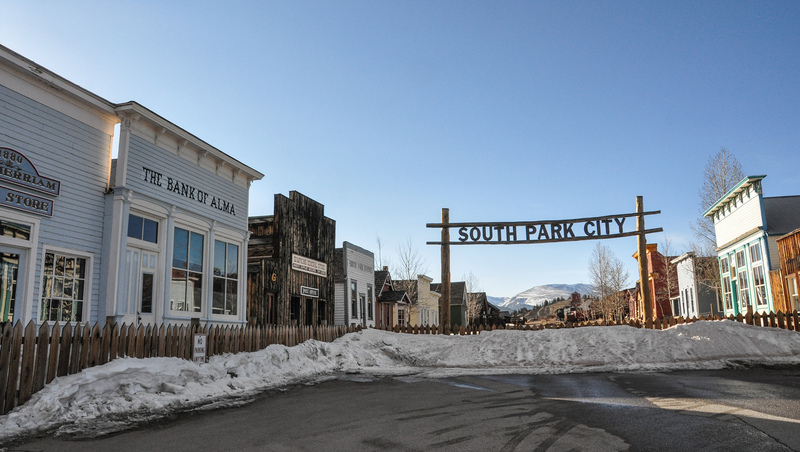 Get an idea of what South Park looked like during the Gold Rush at South Park City in Fairplay, a recreated 1800s mining town with more than 40 historic buildings filled with period furnishings and equipment. Drop a line in the South Platte River’s Middle Fork, Fourmile Creek, Rough and Tumbling Creek, Salt Creek and other Gold Medal streams in Fairplay, known as the Trout Fishing Capital of Colorado. Then, stroll the city’s Front and Main streets, where historic storefronts house intimate art galleries, shops and restaurants. Go boating in sparkling waters south of Jefferson at Tarryall Reservior State Wildlife Area, which affords excellent trout fishing and wildlife viewing; keep your eyes peeled for elk, deer and waterfowl. The Sangre De Cristo National Heritage Area encompasses Conejos, Costilla and Alamosa counties and more than 3,000 square miles. The newest National Heritage Area in the U.S. (designated in 2009), the corridor showcases the rich history of south-central Colorado’s San Luis Valley, home to the state's earliest civilizations and a bounty of natural and historical assets. The massive area includes portions of the Sangre De Cristo Range, Great Sand Dunes National Park and Preserve, three national wildlife refuges, a national forest, two forest wilderness areas, 15 state wildlife areas, a nature conservancy preserve, 20 cultural properties listed on the National Register of Historic Places and the headwaters of the Rio Grande River system. 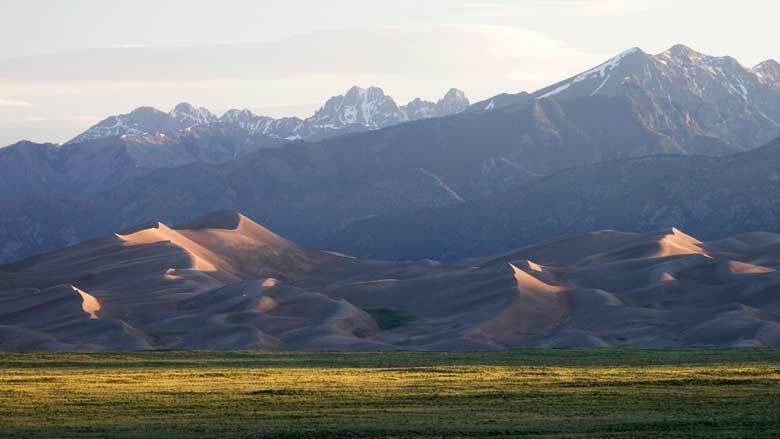 Sled down the tallest sand dunes on the continent at Great Sand Dunes National Park and Preserve (rent special sand sleds at Kristi Mountain Sports in Alamosa or Oasis Store outside of the park). Explore the site of Colorado’s first permanent non-American Indian settlement and oldest city in San Luis. Established in 1851, the spiritual hamlet boasts the Shrine of the Stations of the Cross, a series of bronze statues representing key moments of Christ’s crucifixion. 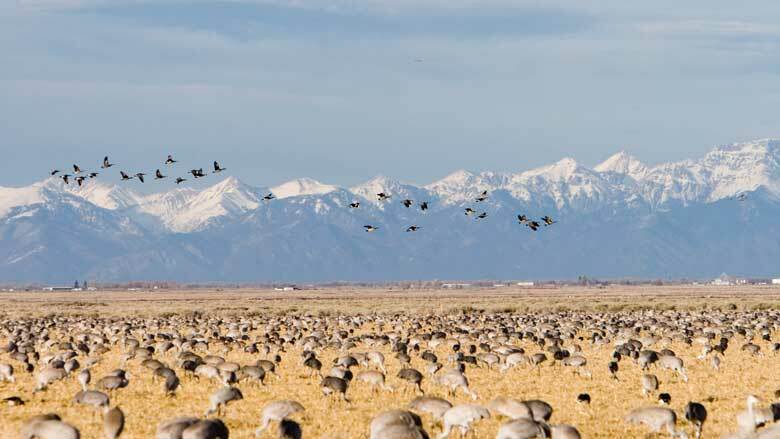 Go birding at Monte Vista National Wildlife Preserve near Alamosa, where lush wetlands supply a year-round habitat for more than 200 species of birds and other wildlife. In March and September, more than 20,000 sandhill cranes stop at the preserve on their migration route. Learn about Colorado’s oldest continuous residents, the Utes or the “Blue Sky People,” and other early settlements at the San Luis Valley Museum and many other museums in the heritage area, including the Jack Dempsey Museum, Fort Garland Museum and Rio Grande County Museum. Hop on the Los Caminos Antiguos, a scenic byway that takes travelers from Alamosa through the center of San Luis Valley to the summit of stunning La Manga pass in the southern San Juan Mountains. Noteworthy stops along the way include San Luis, Antonito and Fort Garland, a preserved military outpost that functioned from 1858 to 1883. Experience a unique Colorado desert ecosystem at San Luis State Park and Wildlife Area, where elk, coyotes and a variety of waterfowl, shorebirds and raptors are known to dwell. The park's Mosca Campground serves as an excellent base for exploring the area and has splendid views of the Sangre de Cristo Range, Great Sand Duness and San Luis Lake. The 120-mile Cache la Poudre River originates in the Rocky Mountains and flows across the plains to merge with the South Platte River. 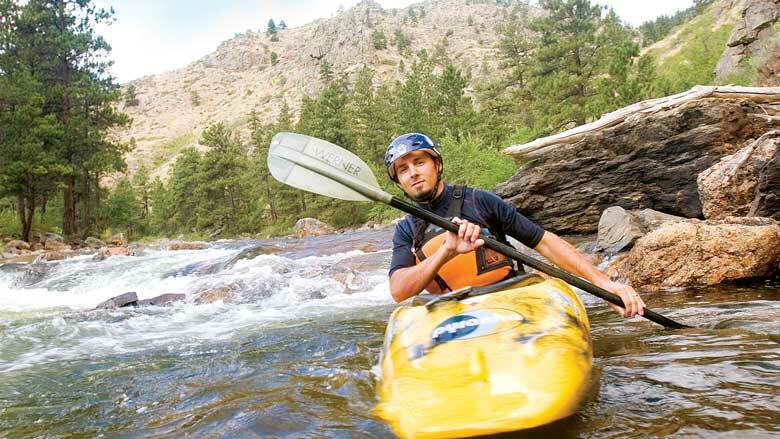 The river represents several milestones, including the development of water law in the Western U.S., the evolution of water delivery systems and shaping of the northern Colorado’s cultural heritage. The Cache la Poudre River Heritage Area extends for 45 miles beginning in Larimer County at Roosevelt National Forest’s eastern border, through Fort Collins and ending east of Greeley. According to local legend, a group of French fur trappers were camped along the banks of the river in the early 1800s. When a snowstorm hit, they decided to lighten their load and hide (cache) their gunpowder (la poudre). As a result, the river was named Cache la Poudre (hide the gunpowder). Walk, bike, run or rollerblade the Poudre River Trail, a 31-mile paved trail along the river from Island Grove Regional Park in Greeley to the town of Windsor. Along the way, keep your eyes peeled for mammals, including porcupines, foxes, coyotes and deer, and more than 300 species of birds. Explore the Araphao Bend Natural Area and see the ruins of the historic Strauss Cabin, one of the earliest log cabins in the area. Robert and George Strauss, who built the structure on land they homesteaded in the 1860, represent some of the earliest settlers to use the Cache La Poudre River's water for irrigation. The natural wonderland that surrounds the cabin offers excellent fishing and bird watching (more than 80 avian species inhabit the area). Tour Fort Collins 1883 Water Works, which housed the area’s first pump house. The 26-acre complex’s four buildings and two revolutionary irrigation ditches drove water through wrought iron pipes to Fort Collins homes from the Cache La Poudre River until 1905. Tours are offered second Saturdays of each month (May–October). Investigate more than 30 historic structures at Centennial Village Museum in Greeley, an 8-acre complex that interprets the history of Greeley and Weld County from 1860 to 1920. Don't miss the boyhood home of Delphus Carpenter, a major figure in establishing the state's water law as Colorado's commissioner of interstate streams. Look for Colorado's state mammal — the bighorn sheep — on the Cache la Poudre-North Park Scenic Byway, which follows the route from Fort Collins to Bellvue used by settlers to connect the northern plains of Colorado with the Green River Settlement in Utah. Embrace your wild side at Lory State Park near Fort Collins, where rocky hills, emerald valleys and ponderosa pine forests supply a paradise for backcountry campers, hikers and bikers. The park is bordered by Horsetooth Reservoir, a locals' favorite for kayaking, canoeing, and trout and bass fishing. Check out our listings for historic places and districts and read 8 Ways to Experience Colorado History, See for Free: Colorado Historic Districts and Historic Forts in Colorado.